Bitcoin – can significant changes in the direction of the price be forecast? Revised 16th, 29th, 30th, 31st March 2018, 12th April 2018. I expect this post will be updated regularly. 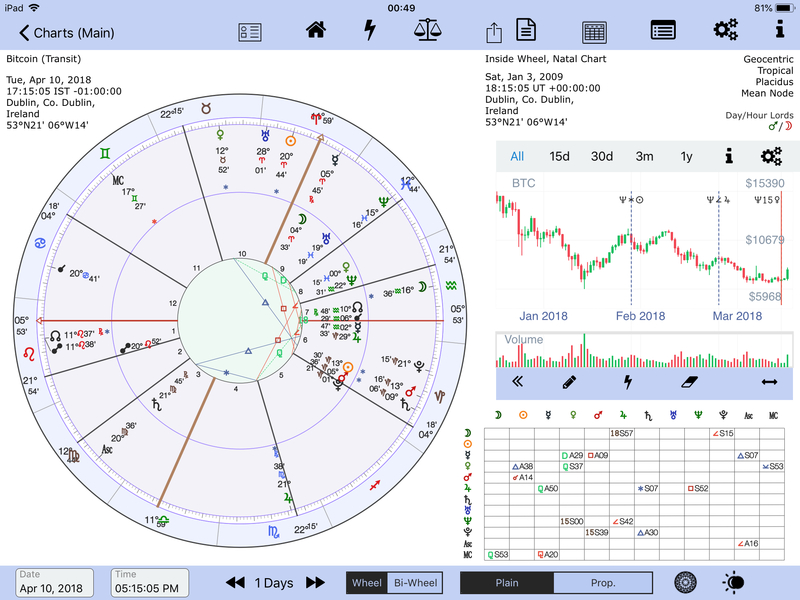 Most, if not everyone agrees that the astrological radix chart for bitcoin is Jan 3rd 2009. The start of the Genesis block. The location is open to question. I use Dublin, Eire. Maybe it can be surmised that the first BTC transaction was universal (the Bitcoin network is decentralised) and so there’s no real place of birth. This may be a dubious supposition but it gives an easier chart to work with. The ASC and MC can be ignored, at least initially. This how I approach the radix. Why only transits to the radix? What about secondary progressions to the radix? The simple answer is that they don’t seem to work, ie there’s no correlation with the ups and downs of the bitcoin price as far as I can discern. Besides the chart is very young therefore there are very few aspects. Ingresses (Saturn and Uranus only) seem to resonate well. 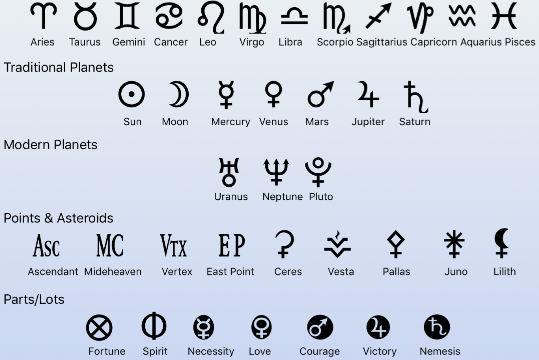 I only use Jupiter, Saturn, Uranus, Neptune and Pluto transits. In this analysis I use transits to the radix chart, almost exclusively. 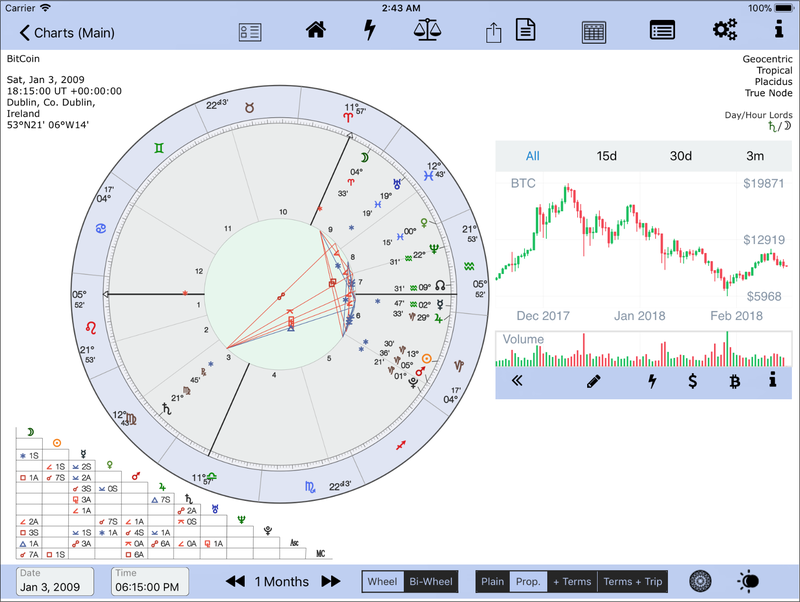 However, it appears that significant movements in the Bitcoin price also respond to Saturn and Uranus transit to transit aspects. 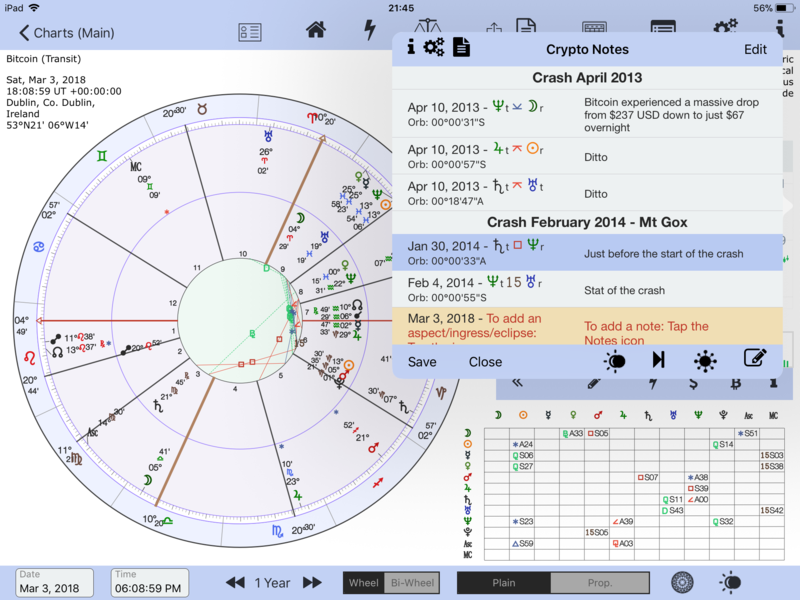 See below the screenshot of Bitcoin Notes, Crash of April 10th 2013, Saturn quincunx (150) transit to transiting Uranus. 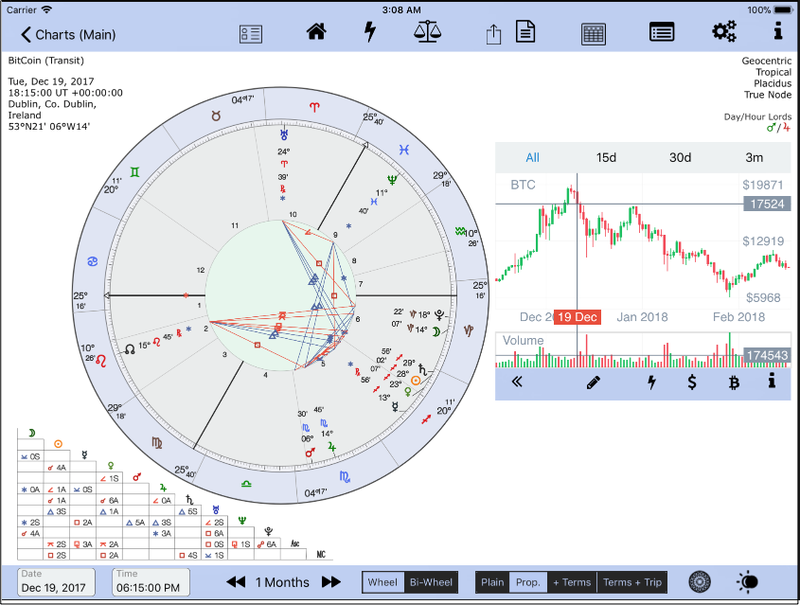 What the Bitcoin astro chart should do is to reflect the tops and bottoms of its associated financial chart. Does it? Here’s my analysis over the period from 17th December 2018 to March 31st 2018. The degrees 0, and 30th degree are emphasised because of the zodiacal positions of Venus, Jupiter, Pluto and the North Node..
Why would this signify the end of the bull run? Saturn’s at home in Capricorn, so the balance has shifted in Saturn’s favour. Note there was also a Saturn 30 degree aspect to radical Jupiter. March 3rd 2018 – a drop in price? A transit of Saturn is going to aspect radical Neptune with a 45 degree aspect. I expect this to signify a downward fall in price. Note that at the beginning of February 2014 a square transit of Saturn to radical Neptune happened at he same time as the Mt Gox crash. The price fell from $867 to $439 (a 49% drop). Let’s hope the fall isn’t as drastic. The big question is “Did this aspect signify a drop in prices so that the Saturn aspect dominated until the next major aspect”? Here’s an aspect I missed. Transiting Neptune 15° to radical Venus. Here’s another example of transiting Neptune (April 10th 2013) aspecting the radical Moon this time with a semi-sextile within 02′ of arc. Note that Jupiter is 150° to the radical Sun and Pluto is almost 18° (01′ of separation) to radical Jupiter. Note that not all of the aspects shown above have been discussed in this post. Tentative conclusion. Is it significant that the three most striking and powerful inflexion points are Saturn’s aspects by conjunction and square? I think so. Both aspects are astrologically considered to be among the strongest, along with the opposition. And perhaps the next two most powerful inflexion points are Saturn aspects too, Dec 17th 2017, and March 3rd 2018, increasing the likelihood of Saturn’s aspects being the ones to watch. Which is not surprising. What about aspects from or to Uranus, the other contender in the radical opposition? Only one of note, Jan 16th 2018, with a powerful downturn. Pluto sextile radical Uranus, with (almost) an aspectual zero orb. Since writing the above two paragraphs Neptune has taken a somewhat leading role. Interesting! A major event in the life of Bitcoin is signified when Uranus ingresses into Taurus, May 15th 2018, from its natal place in Aries. I think this will signify a new vitality in BTC. 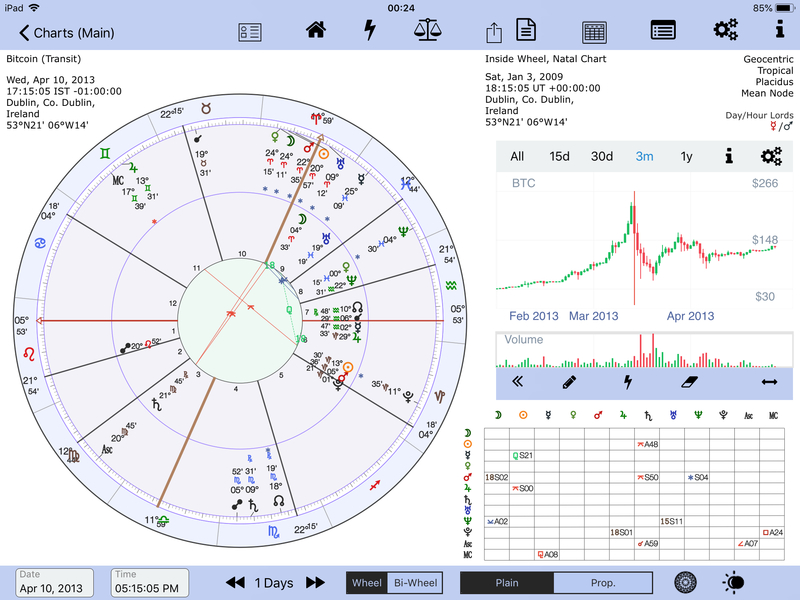 The ruler of Taurus, Venus is exalted in the BTC chart. Whatever happens it will be significant I believe. Will it be as significant as the Saturn ingress into Capricorn on the 18th Dec 2017, signifying the end of the BTC bull run? Could be. Hold on to your hats! Prior to the ingress into Taurus Uranus aspects radical Jupiter with a square on May 5th 2018. Will this be a foretaste of the ingress? Are there any aspects prior to Uranus square Jupiter that might change the downward direction of Bitcoin, as of March 30th 2018? There are a few Jupiter aspects, but nothing else of note, AFAIK. Except for the powerful Neptune aspect I missed: Neptune 15° to radical Venus – see A sudden surge upward – 12th April 2018. Can all inflexion points be forecast? Can all price directions be forecast? No, in my opinion, that’s just not possible. Being able to get some/many is enough surely. These forecast (apart from the Saturn ingress) were all made prior to the event, except when noted. Nothing here is retrospective except in the writing of the aspects and events. The correlation between the inflexion points and the transiting aspects to the radix is not affected either way, ie the dates of inflexion and their associated aspects cannot be manipulated after or before the event. We are dealing with facts not suppositions. Note that this post does not constitute financial advice of any kind. DYOR. Comments are moderated by the author prior to publlcation. Aspect: the angular distance between two planets/points. In this post, aspect are mostly between a transiting planet and a radical planet. Major aspects: 0, 90, 120, 180 – the 0, 90, and 180 degree aspects are considered to the most powerful. Other: 15, 30, 45, 60, 135, 150 – the 45, and 135 degree aspects are often considered to be the most powerful of this group.